Where is the Garden of Ridvan? 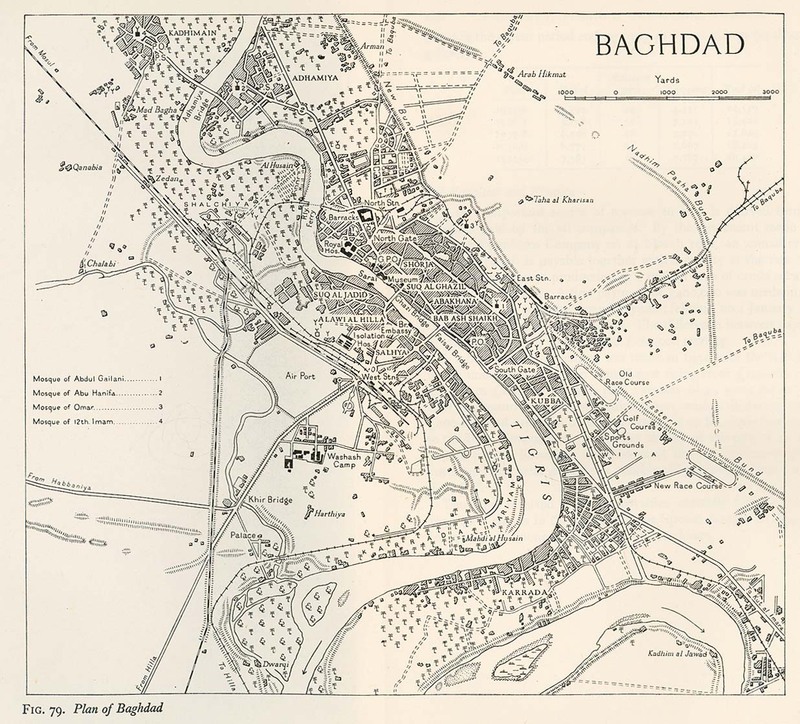 After His imprisonment in the Black Pit, Baha’u’llah was exiled to Baghdad. The group arrived in the capital of modern Iraq in the spring of 1853. Baha’u’llah soon left to live in solitude for two years in the mountains of Kurdistan. In 1856 He rejoined the Holy family in Baghdad and wrote among His most important works: the Kitab-i-Iqan (Book of Certitude), the Hidden Words, and the mystical Seven Valleys and the Four Valleys as responses to questions from Sufi mystics. Baha’u’llah lived in Baghdad off and on for ten years, which is probably why He designated it as one of two sites for Baha’i pilgrimage. But the authorities became wary of Baha’u’llah’s growing influence so they once again banished Him. This time to modern day Istanbul, Turkey (Constantinople). As the belongings of the household were being prepared for the move, Baha’u’llah retreated to a small island within the bank the Tigris River [see below for correction]. There, He and a small group of Babis who were devoted to Baha’u’llah camped out in tents for 12 days. On the 9th day the rest of the Holy family came to join them. The hours passed with Baha’u’llah chanting and revealing verses among the trees and greenery of that garden which was renamed “Ridvan” or Paradise. Some time during those days, we don’t know exactly when, Baha’u’llah explicitly told them that He was the One foretold by the Bab. Baha’is all over the world celebrate these days with special attention to the first, ninth and last as Baha’i Holy Days. Could this be the location of the original Ridvan? Curiosity got the better of me, so with the help of Google Maps, I searched along the section of the Tigris River that runs through Baghdad. There were quite a few ‘small islands’ which could qualify. I chose one of them to show you in the picture on the left. Want to search for the Garden of Ridvan yourself? Use the + – to zoom in and zoom out, you can also grab the map and push it around. Thanks to Don & Steve (see comments below) the site of the Garden of Ridvan is found! I was wrong to assume it was an island. It was actually situated on the banks of the Tigris River. It is on the banks of the Tigris River just in front of the present site of the Medical City hospital complex (labels A and B) in the map above. Right now many Iraqis are rushed there for emergency treatment as a result of the violence. Please keep the people of Iraq and the soldiers stationed there in your thoughts and prayers during this Festival of Ridvan. Right now Baha’is are advised to not travel to Iraq for Baha’i pilgrimage because it is simply too dangerous. But I don’t have any doubts that within our lifetime this will change. Wouldn’t it be wonderful to be able to go and say a few prayers on that spot? Happy Ridvan ! The King of Festivals is here !! The garden of Najib Pasha was across the river and on the north edge of the city at that time. It was what we would call a park. It became the site of the Royal Hospital later named the Republic Hospital. Note it is not far from the “North Gate”. This was the northern edge of Baghdad. The island that had a Garden of Ridvan was in the Holy Land. The Najibiyyih Garden in Baghdad, known to Baha’is as the Ridvan Garden, was probably named for Muhammad-Najib Pasha who had been governor of Iraq between 1842 and 1847. It was a large agricultural area situated immediately north of the walls of the city on the east bank of the Tigris about 450 metres from the Mu`azzam gate and directly across the river from the district in which Baha’u’llah lived. It was also on the road Baha’u’llah would take to Istanbul and thus was well-placed to assemble the caravan for the journey, as well as being a convenient spot to receive visitors. Early maps and photographs show the Najibiyyih as a wooded garden. Najib Pasha built a palace there and a wall around the garden. Najib Pasha dies in May 1851 and the garden was presumably in the possession of his heirs when Baha’u’llah used it. It was purchased by the government in 1870 and used as a guest house for Nasiru’d-Din Shah when he visited Iraq in 1870. In the twentieth century the Royal Hospital was established there and it is now the site of Medical City, a large modern teaching hospital. Iraqi victims of Baghdad’s carnage end up in Medical City, ferried there by residents, ambulances or the militias themselves. Medical City, Baghdad, in pictures. I’m interested in the Valleys because they seem to be a retelling of an ancient Sufi tale. You say they were written to answer questions yet they seem to be a way of aligning Baha’ullah with the Sufis. In effect He was a Sufi when he wrote the Seven Valleys and Four Valleys. If he was answering questions I wonder what they could have been since the Sufis would have known these tales — perhaps there are subtle differences between the traditional telling and Baha’ullah’s? Does anyone know if this is true and what they were? Hi Frank! I’ve been very busy so hardly have time to read or respond to the many posts. Why do you think “he was in effect” a Sufi just because He wrote the Seven Valleys and the Four Valleys? This doesn’t make Him a Sufi any more than His messages to the Kings, Pope and other political and religious leaders of the earth made Him a King, Pope or political leader just because He wrote to them. I think the same goes for His other Writings addressed to specific “people or groups. Baha’u’llah is Who He is. I don’t know why some people were so emotionally upset that you left the Faith. It’s your decision and in my many years of being a Baha’i I’ve seen many people come and go who never actually fully believed in one or another of the principles or teachings of the Faith just like you never accepted the “powerlessness” aspect of the Short Obligatory Prayer. For example, I’ve known folks who left when they realized they couldn’t be as politically active as they would like to be or as sexually active or couldn’t drink alcohol etc. or some just simply got caught up in family life, work and other activities like we all do. I don’t share Bacquia and others “black hole” view of the Faith supposedly the result of SE or the UHJ or AO but that’s what makes the world a great place…the free exchange of ideas. There certainly were w=quite few who thought the Faith was going down the drain when Baha’u’llah passed away and Abdu’l-Baha began leading it. The family certainly were not pleased and the infection (yes, I do believe there are spiritual diseases just as there are psychological and physical ones) of covenant breaking destroyed it to the extent that a childless SE was unable to appoint a successor. Lots of love and compassion my brother! Yes I agree with much of what you posted. I have always had doubts about Baha’i even when I thought I was completely Baha’i. I know of the brain/heart research. My wife is an educator and we have been comparing notes. The heart is an integral part of the brain it appears. We need to think with it more often and often do without realizing it. The Bahai.org website says that unity must come first. But the Dali Lama says compassion and peace of mind for individuals must come first. There is an old Chinese proverb that starts with peace in the heart, then the family and so on until it arrives at peace in the world. The hearts of people must be pacified so that we can have the peace we want. I don’t think Baha’i is the best way to do this but it does offer some hope and some solutions. I think people are shocked when they hear that someone has left the faith because it hits home. They may fear that their linear reasoning will lead them to leave and they don’t want to. So my suggestion is to be far less logical! As to Baha’ullah as a Sufi — I think that’s what he was at his core. That’s why he left ‘contemplating no return.’ He was a mystic. I think he go caught up in the prophecies of the Bab and in his visions and became the promised one but was at heart a seeker and mystic in the Sufi tradition. In fact it seems to me that much of his banishment/imprisonment was a result of his association with the Babis who were violent under the Bab and for a while afterwards. The Babis seems dangerous to the authorities and the authorities defended themselves — to much to great a degree of course. But If Baha’ullah had not been associated with the Babis I wonder what his life would have been like. What do you think? Is it even possible to think this way? Don and Steve, wow! thank you. I’m a bit confused though, the hospital seems to be inland, not on an island. Did it use to be an island? Carmen, by “black hole” I meant the fact that Shoghi Effendi did not follow the instructions left by Abdu’l-Baha. We don’t have a Guardian now and will never have one. This is a huge gaping hole. It is no mere opinion nor view but a statement of historical and verifiable fact. Baha’u’llah wrote in the mold of the “Conference of the Birds” by the Persia mystic and poet, Attar. It is quiet easy to compare and contrast the two. Perhaps there are already papers on this by Baha’i theologians. The most obvious difference is that whereas Attar’s story is a metaphor for the individual’s search for and attainment of unity with the Beloved, Baha’u’llah argued that this is only possible through the current day’s Manifestation of God. You’re probably thinking of the Garden of Ridvan in Akka that used to be an island. As Don says: “The island that had a Garden of Ridvan was in the Holy Land”. Here’s the verdant isle. Thanks Steve, you’re right. The Baghdad garden of Ridvan is on the banks of the Tigris, not an island. A few years ago I read a Sufi story that was so similar to The Seven Valleys that I compared it word for word. Very much the same. Yesterday I went back to the old book that I thought had this Sufi version — it was ‘Mysticism’ by F.C. Happold — and low and behold — its not in there. So I’m a little mystified (or mysticismed) I will see if I can find the reference. What I remember is thinking that Baha’ullah had not written The Seven Valleys but had retold an 800 year old fable. But since I can’t find it I wonder if I just imagined it?! A few years ago I read a Sufi story that was so similar to The Seven Valleys that I compared it word for word. The Seven Valleys of Baha’u’llah is a direct_commentry_on the “language of the birds” by Fariduddin Attar a perfume maker who become Sufi. Similar essays on the steps leading to the spiritual maturation of men date back to Hippocrates. There is a comparative study somewhere between Attar’s work and that of Baha’u’llahs much more optimistic and joyous seven Valleys. I visited the shrine of Shoghi Effendi on the 23rd of April, and you and other friends on this blog were in my prayers. Interesting point here, Carmen; The Seven Valleys and Four Valleys are addressing Sufis, but in fact by examining the context in which each tablet was written, we can understand much better the content of the tablet. For ex, the tablet to a Physician can only be understood by considering concepts and vocabulary used by Persian physicians at that time, and the Gems of Divine Mysteries is more directly adressing the Zoroastrians. Farhan wrote: “I visited the shrine of Shoghi Effendi on the 23rd of April, and you and other friends on this blog were in my prayers. Thanks so much Farhan! One of Shoghi Effendi’s many wonderful qualities was his self effacement and utter humility in the path of service to the Cause of God. It is a testimony to his devotion, as the Sign of God on earth, to the Central Figures that his birthday, passing etc. are specifically not commemorated in any way as was his wish. [quote comment="48951"]Farhan wrote: “I visited the shrine of Shoghi Effendi on the 23rd of April, and you and other friends on this blog were in my prayers. Carmen, Happy Ridvan to you! Can you give me a reference in the Baha’i Scripyure where it says Shoghi Effendi is the “Sign of God” on Earth? “…from him will appear wondrous things that thou wilt hear of in the future. Thou shalt behold him endowed with the most perfect appearance, supreme capacity, absolute perfection, consummate power and unsurpassed might… ages and centuries will bear traces of him.” Abdul-Baha’s comment on Isaiah 11:6 where it says “a little child shall lead them”. I think the site of the Garden is to the left near the boat marina. A 1944 map I saw shows the old boat ferry at the sight of the marina; therefore B landed there before going into the Garden. Also, the buildings around there were the first phase of Medical City, which took over from the old Hospital (Najib Pasha's mansion). Maybe its best we don't know the exact site until conditions there change. Im a refugee living inKiev. Im just curious — where there any anti_Iraqi war activities 10 years ago? Did any Bahais take part in action (as individuals) against this war? From myunderstanding in the Vietnam war in the west there were massive protests in the war, but this time there were almost non. several bahai activists were ex-communicated by haifan bahai authorities for “political involvement” over the last several decades. recently, I heard from a bahai that was ex-communicated for being in a labor union protest of corporatist global economics. there are several theories about how the bahai doctrine of “political non-involvement” originated, and some of those theories point out inconsistencies in the statements/logic of haifan bahai authorities. for instance, abdul-bahai placed some early bahais into the early parliamentary political reforms systems in iran. shoghi effendi, or a secretary writing letters for him, encouraged bahai students to protest against racial segregation in campus housing (in the 1940s or 50s?). many early bahai leaders in the USA were elitists/racists who discrimiated against working class people and racial minorities. There was at least one letter from the administration which directly dealt with this. It instructed Baha’is to not participate in anti-war demonstrations or to make similar gestures. Pure speculation, but I believe that the Spot of the Ridwan Garden is also the Spot where His Holiness Adam received revelation from God, that is, the Garden of Edan. I started to conceive this thought while reading and studying the Ridwan Tablet. It so specifically describes what seems a garden of Paradise, which is what the mythical garden of Edan was supposed to be. And wouldn’t it be fitting that this very Spot where His Holiness Adam received His revelation from God would again be honored with the revelation which unites all things in one common Faith and one Cause, representing the resurrection of all things and their unity in this Day of God?